On a recent trip to China, Bearded scribe Brendan Morgan took a look into the current independent music scene, and found a little gem with Maybe Mars. Rise China! While staying in Beijing for five days, I was especially eager to get a taster of what people listened to. Of course, like every nation welcoming in consumerism (China however has become a strange Capitalist and Communist hybrid), it has its own mainstream pop, or Mandopop as it’s known, as well as importing in plenty of western pop hits and club anthems. Hearing Lady Gaga pounding over the clay roof tops of the muggy streets is only a tiny part of the weirdness a trip to The People’s Republic of China yields. With its various tones and accents, the Chinese language prevented me finding out much of anything. Eventually, due perhaps to all those gifts I laid out throughout my many visits to Buddhist temples, I was granted some good luck. The night before I was due to leave the city to catch a plane to Tokyo, I boarded Beijing’s swish tube network and zoomed up to the University district in the North West where I found club D-22. Since opening in 2006, only a year before the label Maybe Mars was set up, the club has a reputation for being the epicentre of upcoming music in Beijing. Little did I realise how important the venue is to the city’s student counterculture. Almost every home grown Chinese band worth mentioning has graced its small, smoky stage. Like living legends, their group pictures decorate its walls. Before I go any further, it might help to put the label into context. Among a population 1.4 billion and rising, Maybe Mars is born out of an increasing desire for free expression, after it was ruthlessly suppressed under the dictatorship of Chairman Mao Zedong and his successors. It is a deep and complex history of violence and fear generated by a strangling state control and an uncompromising bid to modernise the country. As a way of banishing the demons of the past and in a desperate bit to be the great Nation it always dreamed of, China is currently absorbed in an almighty superiority complex. Its bloody history is a touchy subject, often swept under the carpet altogether as social problems and criticism simply get in the way. State TV blares out repackaged history and successful economic figures, the sports channels play their victories over and over. These days, China’s collective of artists and musicians have been given more space in which to exercise and explore their talents, provided of course they don’t go too far. It explains why most Chinese keep out of politics, if they are aware of it at all. Though none of the bands signed to Maybe Mars latch on to any overt political activity or statement, its culmination shows the new desire to carve out artistic freedom from the ground up. The internet is playing its part to help knock down old borders. A music movement in China might just be the last swing of the hammer. The Maybe Mars website offers live videos, streamable music, press coverage and a free compilation ready to download. Each of the 29 bands currently signed to the label make up a broad mix and not everything is sung in Chinese. While incorporating many familiar western style and genres, they all hold on to a strong sense of individuality and respect for their musical origins. My favourite would have to be the outstandingly awesome Carsick Cars. Likened to the Postpunk guitar mashing sounds of Pavement and Sonic Youth (even touring alongside them back in 2007), the band dive headlong into dense, sometimes painful guitar textures inspired by the experimentations of Glenn Branca. ‘Guang Chang’ starts on feedback atmospheres and builds up, giving way to epic chords. Tracks like ‘Zhi Yuan De Ren’, with its king-sized riff and ‘Zhong Nan Hai’ (named after a Chinese brand of cigarettes) with its searing distortion drones, remind you how glorious and affirming Rock can still be. Another band that put Maybe Mars in the spotlight are P.K.14. They join up a new-wave, Television like sound with the assertive poetry of their headman Yang Haisong (the guy also responsible for recording most of the labels bands). With real flare and a dedicated fan base, Demerit and Joyside represent the label’s hot-blooded, foot-to-the-floor punk groups. Ourself Beside Me, three cool Beijing ladies, play a different kind of sneering, eccentric, off-key punk inspired by the sleazy sounds of The Velvet Underground and The Fall. Using bicycle bells and plucked guitar harmonics over a lazy beat, their brilliant track ‘Sunday Girl’ shows Beijing’s sinister side. The label has also just signed Duck Fight Goose. Sounding like a cross between Battles and These New Puritans, they are China’s answer to the math-rock scene. 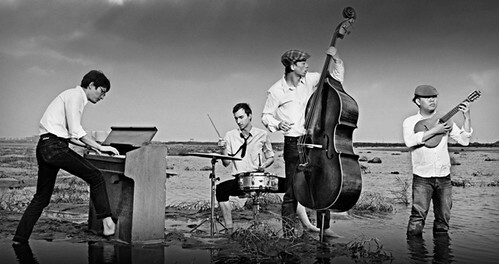 The band members give themselves animal alias’ (Duck, Goose, Panda, Dragon) and “refuse all kinds of sadness and play funny games with their instruments”. At D-22, I managed to see the duo called 10 (now renamed (((10))) after the recent earthquake in Japan) perform their characteristically long and ever-evolving sonic wizardry. Drinking Tsing Tao beer in the gallery up above, I got a bird’s eye view of the array of machinery bellow. Pedals, keyboards and iPads combined together to fill up the club, until it felt like the whole place was about to burst. Maybe Mars breaks away from the production line method of imitation that we in the West came to associate with China. It’s a huge leap ahead of the music endeavours of the past and has attracted much attention and support from New York and London musos. According to one of the promoters I’d met in D-22, Maybe Mars is China’s only independent record label and as far as I know, the label focuses its sights mainly on Beijing and Shanghai. In this vast and varied country there must be plenty of others just waiting to get going. Maybe Mars continues to be on the front line of a musical revolution. The label takes upon itself the monumental task of nurturing a rising alternative scene and providing a voice for the country’s disillusioned youth. Like it or not, China is set to become a powerful force over the century. Few countries need a subversive Punk and Art Rock movement more. Put aside the China-phobic sentiments that are blowing about and clasp hands with the guys who are on the verge of making history.